Dancers perform in Zoe/Juniper's "Clear and Sweet"
More than a year ago, Zoe Scofield and I sat down at her kitchen table to talk about the power of art. I’d been chasing an ephemeral scrap of an idea for months; how art functions as a conduit to the divine, to a state of grace, if you will. I thought Scofield might have some insights. During our long conversation, Scofield, one of the smartest artists I’ve met, remarked that she and her husband/artistic partner Juniper Shuey, were hard at work on a new piece inspired by a musical tradition known as shape note, or sacred harp, singing. The project goes back to 2014. Scofield was visiting her mother’s home in northern Georgia and happened upon a television broadcast that featured shape note singers. She felt an immediate emotional connection with the music. Singing with the audience, part of Zoe/Juniper's "Clear and Sweet"
The harmonies sound as if they've emerged, raw and resonant and primeval, from the Appalachian hills. The singers face inwards, and when they lift their voices together, the sound vibrates. You can almost feel it, the way you can feel the vibrations from a tuning fork. The work’s Seattle premiere at On the Boards October 20-23, featured ten shape note singers, five dancers, an original recorded score, plus video and visual art. It was a moving mix of intricate movement and music, and one of the most personal and vulnerable performances I’ve seen this year. 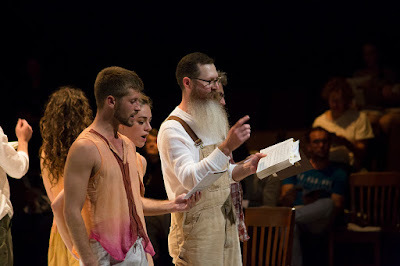 At times "Clear and Sweet" brought me to tears, evoked laughter, gave me a sense of fellowship with the people in the room, both the artists and the audience members. In “Clear and Sweet,” the line between performer and witness is quite permeable. The dancers and singers mingle and chat with the audience. Then,one by one, they drift off to begin the show. Regularly, they return to straight-backed wooden chairs placed in the first row of the audience seating, to rest, or sing, or watch along with the rest of us. 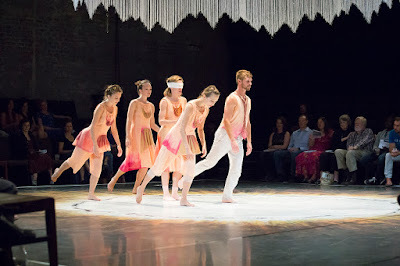 Zoe Scofield, in blindfold, with her dancers in "Clear and Sweet"
One striking element of this show is that the dancers spend significant time blindfolded, either groping their way around the floor, or being guided by a fellow artist. They’re searching for something, in the same way we’re all searching for something in this life, whether it’s love, or money or something more existential: salvation, meaning, to leave our mark on this world. 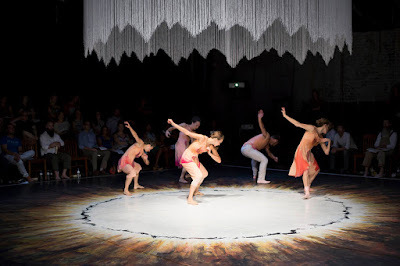 I must tell you that all the dancers were technically polished, that the plaintive harmonies of the singers were haunting, that Shuey’s central installation-- a hanging circle of fringe on which he projected moving images--was a visual metaphor for the path to the divine. In all, “Clear and Sweet” is a stunning and accomplished work of art. More than that, it's a springboard for reflection. Juniper Shuey told me he’s been pondering the question “what do I believe in?” In this hip, progressive 21st century city, it’s not really cool to discuss one’s search for spiritual fulfillment. And yet, lately, in private conversations, you discover that we’re all searching for that exact same thing. "Clear and Sweet" provided an opportunity to recognize that search in one another. After the performance ended, the audience lingered, eager to talk about the experience, the work, where it resonated with each of us, like the lingering vibration of a tuning fork. I’m still sitting with the power of "Clear and Sweet", turning it over and over in my mind, finding new meaning with each turn. And so grateful that Zoe/Juniper opened the door to contemplation. 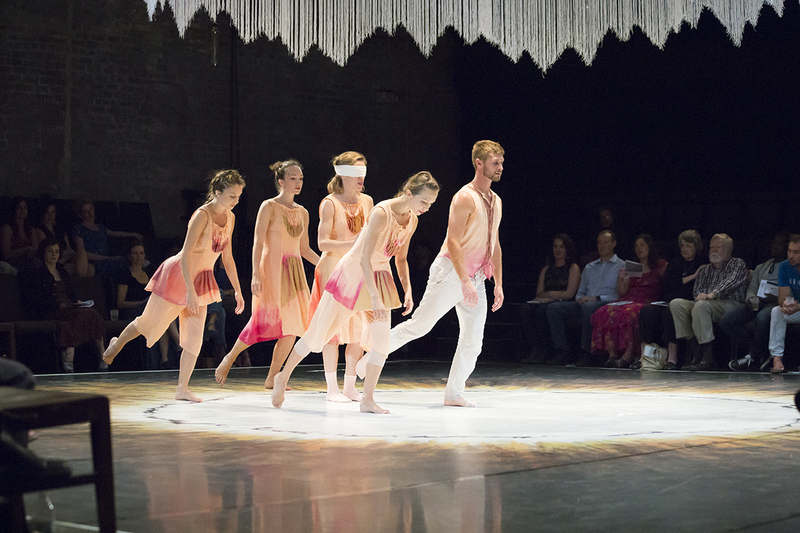 Dancers in "Clear and Sweet"